Ray James Tjangala is the son of Anatjari Tjampitjinpa (1927-1999), one of the founders of the Papunya Artists Collective. 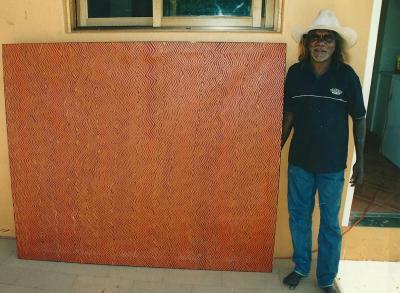 Ray James was born around 1958 in the bush and in 1963 left his traditional nomadic lyfestyle and moved to Papunya with his family. It is noteworthy that Ray's friend, Yala Yala Gibbs Tjungurrayi, one of the first painters of Papunya and an authority on ceremonial activities, had a decisive influence on Ray’s work. His paintings are usually executed in two colors. By playing with the possibilities of optical lines and curves on a two-dimensional surface, the work of Ray James creates a strong illusory effect.